I love The New York Times. My affection for its prestige started in high school, when I changed the layout of the student newspaper, in an attempt to mirror its class. In college, I frustrated roommates with stacks of newsprint that I picked up by the cafeteria each morning. Even then, I knew New York was my home, The Times my paper. Nurses, blamed for negligent care outside of their scope, went unnamed or unquoted in recent NYT articles. But lately, I’ve been a bit miffed by what is landing on my doorstep. For years, I’ve noticed nursing’s absence in its hallowed pages of print; a problem I recognize, stemming largely from our silence, but there have been a few recent pieces that include reference to nurses, but names, or interviews none of them. One, a piece on the growing prevalence of long term acute care, cited six separate physicians, and though it referenced multiple aspects of nursing care, didn’t quote or name a single RN. Long term acute care is a mecca of nursing – physicians spend a fraction of time with patients – and for an article that focused on the oft-sad, and rarely resolving cases that land in these facilities, the absence of nurse voice was particularly confounding. But this weekend, during my Sunday peruse of the front section, I couldn’t help but stir with anger when I read a piece about the recent safety scandals that are popping up in the VA hospital systems. Again, multiple physicians were interviewed and named in a thorough and jarring account of the current tragedies, but not a single nurse joined their ranks. The difference in this piece, from the long term acute care piece, which simply ignored nursing, was that it actively painted a slur-filled picture of the nursing care that was offered, or in many of the cases, inferred as witheld. In the second paragraph of the article which ran on the front page, the authors suggest that a young pregnant patient, Jessica Zeppa, who quickly died from untreated sepsis, did so, because of neglect on behalf of nurses. 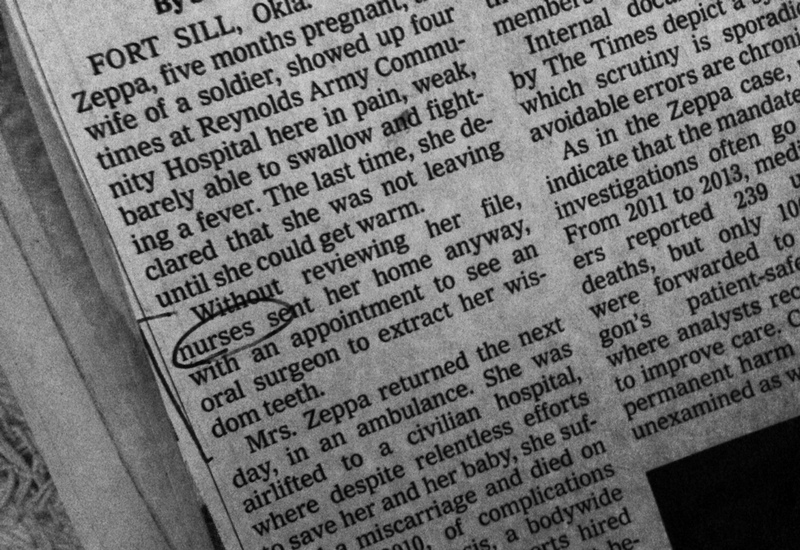 “Without reviewing her files, nurses sent her home anyway, with an appointment to see an oral surgeon to extract her wisdom teeth,” appeared within the first one hundred words, a coveted place in any article, much less a front section, front-pager. Funny, I thought. Nurses sent her home? Last time I checked, it was out of an emergency room nurse’s scope of practice to discharge patients without the order of a doctor. And to do so without reviewing a patient’s prior record? Well, that seems like highly sloppy nursing care, yes, but again, ultimately falls on the shoulders of the prescribing provider. Later in the article — a good two thousand words later — the authors return to the nurses described in this second paragraph. These “nurses” are actually a nurse midwife, Kelly West, who does possess the authority to discharge a patient. But she isn’t quoted, her credentials aren’t listed, and her admittance to ignoring the patient’s records (which the doctor on the case also neglected to review, citing frequent systems inefficiencies making the practice futile), gained her the phrase, “violating standard of care.” No explanation of the faulty record system was given. A few other instances of nursing popped up in this lengthy article. One, sadly believable, told of a nurse sarcastly greeting a woman in active labor to the unit she had been denied admission hours before. Her son went on to suffer disabilities from the delayed care, an occurence that is highly tragic, but likely the result of a series of complex system and communication failures. The fact that the words of a snarky nurse overshadowed the safety breakdowns in this scenario, however, depicts the oft-sexist discrimination that our profession suffers from. Similar to Hillary Clinton having to make comments on her sartorial choices far more often than her foreign policy ones, nurses ‘tudes seem to surface far more quickly than their life-saving actions. While this nurse’s actions are unfortunate, they were likely not the root cause of harm in this case . Whoa. While I want to be respectful of this, and all tragedies that occur this way, I’m a little shocked that the ultimate outcome of the child’s birth is dependent upon the nurse. As an experienced nurse, I can see how the ratio of 32 alarms to four attempts to contact the MD might seem neglectfully imbalanced. But we know that sometimes alarms alarm for reasons that our trained eyes don’t agree with or need to see; ignoring superfluous alarms is routine to us, but should always be paired with heavy patient education. In this case, or in the way this case was worded, it seems the alarms needed MD attention. Yes, if a nurse feels a patient desperately needs a doctor’s presence, and is having trouble procuring it, she should quickly and convincingly rise up the chain of command to alert his superiors. But there is absolutely no doubt in my mind that more was at play in this case than a nurse not badgering a resident enough. While the preventable handicapping of a healthy baby is the ultimate tragedy, the fact that this nurse likely hid in a corner, cried, and swore she’d (or, definitely, he’d) never speak of this event again is also tragic. When she didn’t speak up for her care, she gauranteed her place of blame in the eyes of the family, the patient, and the public. No one heard of the other patients she was tasked to care for, whether any of them were also in active labor, if the unit was short-staffed, what kind of education or experience she held, or if the resident dished her a huge plate of attitude and anger, as many often serve. By zipping her lips out of fear, she surrendered her right and duty to expose – and help to correct – a flawed system that she played the integral part in. These authors, by showcasing this lawyer’s statement in their article, are unknowingly doing a better job than the nurse of showing her vital place in the context of care — by assigning total blame, they are also assigning ultimate irreplaceability. Her voicelessness adds to the sadness of this story, but also exposes a large part of the safety problem exposed in this piece – nurses’ invisibility. In sum, I thought this article bordered on tabloid quality. The topic is important enough to headline daily, and it is sad, that the VA is struggling with patient safety issues in such a public way. But the authors failed to capture the fact that mistakes like this happen in all types of hospitals around the country, and they are best solved in the same way — not by shaming or penalizing providers who, after all, are humans, too — but by recognizing errors as flaws in the system, fixed by interdisciplinary analysis and collaborative problem-solving. Interdisciplinary care is the key to preventing the horrors seen in this piece. But interdisciplinary care means exactly what it sounds like it means – care across all health care disciplines, with equal participation, equal voice and equal support. Throwing nurses under the bus for systems problems without giving them a chance at voicing their perspective is anything but constructive. As nurses, we should stop hiding under that bus, and start talking about the comprehensive realities of patient care that we are often the center of — for the safety of our patients, and the growth of our profession. Next time we’re on the front page of a major newspaper, let’s not appear as nameless scapegoats. ← What are YOU Tweet-gram-book-tumblr-share-ing Today, Nurse? Make it Count. I, too, have noticed a change in New York Times reporting–more leanings towards the dramatic than factual. Thank you for reminding all nurses to keep alert to news stories in any paper that does not portray nursing accurately and respond with letters to the editor or in on-line opinion pages. Any thanks for the reminder that nurses need to speak up on their own behalf.